They say things always come in threes. We’ve already had three brilliant episodes, but with two painfully mediocre episodes in the last two days, here's hoping Unscheduled Stops doesn't live up to that saying in the bad way. Unfortunately, it does. And the worst part is that it's Helen Farrall who wrote it. It’s fair to say that Thomas and Bertie’s appearances together in recent years have followed a similar formula: the two race each other (or have some form of competition), one gets into trouble and the other helps out. While this does follow that, it’s done with in the first minute or so, meaning the focus can go towards the rest of the story. And the rest of the story is good. It’s basically Thomas Gets Bumped but from Thomas’ perspective. There’s also much more character since there’s so little reliance on the narrator to tell the story. In hindsight, I feel that style of storytelling held the model era back a bit. I also love how the Fat Controller was handled here. Some critics have (fairly) bemoaned the fact that he's far too goofy in recent years and no as authoritative as he once was. But this gives us a great balance of both. In fact, it's because he wants to be authoritative that the goofiness occurs. It's a great juxtaposition. Also, Bulgy returned. It's nice that we got a genuine surprise for the first time in years. Big Mickey would've been more of one had Channel 5 not spoiled it with the thumbnail for New Crane on the Dock, Hannah's introduction would've meant more had fans not turned into tabloid journalists and Daisy, Donald and Douglas' return (and the small engines' introduction) in Lost Treasure would've been more amazing had official sources not revealed them ahead of time. We need more surprises in the future; they're fantastic. That said, it's four days in a row where the target audience is introduced to someone new or someone only older fans are likely to know about. That's... overkill, and a lot for a preschooler to take in. Don't get me wrong, the specials have the exact same problem (if not worse since there's so many that get little to no character whatsoever). But that's become expected and banal. This, however, was a freak occurrence so it's more noticeable. However, there is a 24 hour gap between each one, so at least there's a bit of breathing room, unlike the specials where the newbies are all crammed in to 60/70 minutes. Back to the episode, which has one major flaw: Thomas gets no comeuppance for his actions. He gets told off, but that's it. Fact is that if their parents are going to rely on TV to drag their kids up for them, they need to be taught valuable lessons through the characters, and that doesn't happen. Maybe if Thomas had been sent to the shed and Percy or Emily had taken the passengers instead? As written, Bulgy taking Bertie's passengers feels like they're rewarding Thomas' bad behaviour by taking some of the load off him. 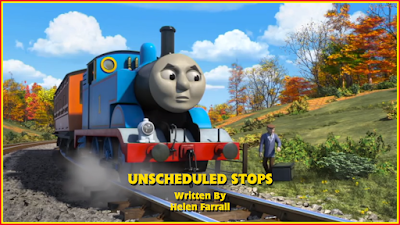 Because of this, any themes the episode tries to portray are incredibly weak; the weakest that Helen's ever produced. Maybe with a re-write or two, this could've been fixed, but as written, it feels slightly toxic. Apparently, this could be Helen Farrall's last series as her CV says she only has three episodes commissioned. If so, Mattel will be losing someone incredibly talented. I’m not going to make baseless claims as to why she won’t be returning (or if the rumours are true). All I’ll say is that she’ll be a huge loss and her work will forever be appreciated by a majority of fans. This episode isn't that great overall. It’s funny and well paced, but its theme and lesson are so bad due to Thomas not getting any punishment for his actions that it drags the whole thing down. The fact that she brought Bulgy back was great, but it doesn't take away from its flaws. What do you have against Helen Farrall? I'm sure she's a nice person. Me: bemoans the fact that their favourite writer wrote one bad episode. Also me: says that Mattel are losing a talented writer. ...where did I criticise Helen as a person again? The worst I did was criticise the story and themes. You know, like a critic is supposed to do? Unless someone made a truly toxic episode/season/show, I think it's ridiculous to bash a writer or producer personally.